If you own a garden but hate the thought of having to get your hands dirty, not to worry – you can still enjoy your outdoor space in all its glory, without having to regularly maintain it. With some careful thought and planning of how to style your garden along with what to include in it, you’ll be able to sit back, relax and make the most of a garden that works just right for you. Here you will find a range of tips and tricks for easy to maintain garden landscaping. Our words of wisdom should help you to get your garden looking fantastic in as short a time as possible, along with keeping it looking that way for as long as possible, too! Firstly, you’ll want to look at your current garden layout, make a note of the pros and cons within it, and use this insight to develop a plan of how to go about transforming the space into your ideal garden landscape that will be easy to maintain. Are there any existing features within the garden that you would quite like to keep? There’s probably a fair amount of things you will want to remove. This step by step process will help you to strip the garden to its bare roots in as quick a time as possible, ready for you to make the key adjustments and improvements. To keep things simple and easy to maintain, it makes sense to keep the busier areas of the garden as close to the house as possible. That way, you’ll have easier access to the house for bringing things out to the space and clearing them away, giving you more time to enjoy the garden as intended. With that in mind, try to keep the less used spaces, or areas requiring minimal additions towards the back end of the garden. Many will choose to completely strip the garden of any plants at all, in order to make the outdoor space as easy to maintain as possible. However, if you’d prefer to keep a little greenery in your garden, it’s wise to opt for the most robust options, that require very little tending to. Trees and shrubs instead of plants and flowers are your best bet for an easy to care for garden, as they require very little maintenance and they will stick around year after year, providing plenty of flowers and foliage. Perennials are also a great option, such as lavenders, as they typically last all year round and can look after themselves during harsh weathers. Top tip: Try to stick with native plants, as they will be used to the local weather and will find it easy enough to take care of themselves. Rather than having a variety of plants spread across the entirety of your garden in flower beds, plan out certain areas within the garden to dedicate to your foliage. Typical modern landscapes will position plants in a few raised square areas of the garden, which proudly display the variety on plants in a way that will prevent them from overgrowing, therefore minimising your need to prune them. Top tip: cover your planting areas with mulch, which will break down on its own and fertilise the plants. Better yet, it will also help to prevent weeds and only needs replacing once a year in spring, leaving you with less stress and more time to enjoy the outdoor space. You could even add a rain barrel into your garden, that collects plenty of water for you to use for pruning your plants. How much easier could maintaining your garden get? Paving stones or decking are two of the best materials for an easy to maintain garden, requiring very little upkeep except for the odd cleaning or restaining (for decking) every now and then. Try to use these materials as much as possible throughout your garden, perhaps allowing a little space for a grassy lawn and potting areas for plants. Top tip: Always invest in a quality paving for the ultimate durability. 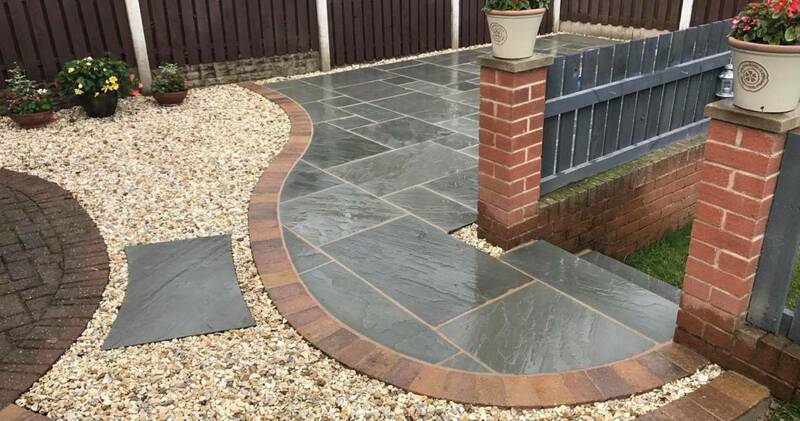 It may seem costly at the time, but you will thank yourself in the long run, when your paving lasts for years with very little maintenance required. The easiest grass to maintain is, of course, artificial grass, and there’s plenty of options to choose from these days, so you don’t have to worry about it looking glaringly fake. However, if you are certain that you would like to keep at least some real grass in your garden, try to keep the area as regularly shaped as possible. A simple square section of grass will be much more easier to mow and maintain than an irregular design. Whether that’s a rust-resistant barbecue or some sturdy seating areas, you’ll want to make sure your outdoor furniture can withstand all seasonal weather. That way, you won’t have to worry about lugging it all into the garage every time the weather takes a turn for the worse. Last but not least, try to include a shed or other storage space within your garden, to keep anything that you might need to maintain your garden. Chances are you will have to carry out a little bit of maintenance, but having everything you need all in one place will keep these tasks as quick and simple as possible. With our helpful tips on easy to maintain landscaping, you should have your brand new garden up and running in no time at all, ready for you to relax in the warm weather and admire your handiwork.